If you have a large group booking to make for this year’s Christmas meal then it is not too soon to begin thinking about your reservations. Our Christmas Italian food menu is hearty, satisfying and decadent – guaranteed to be a crowd pleaser and to leave your entire group feeling full and feasted. 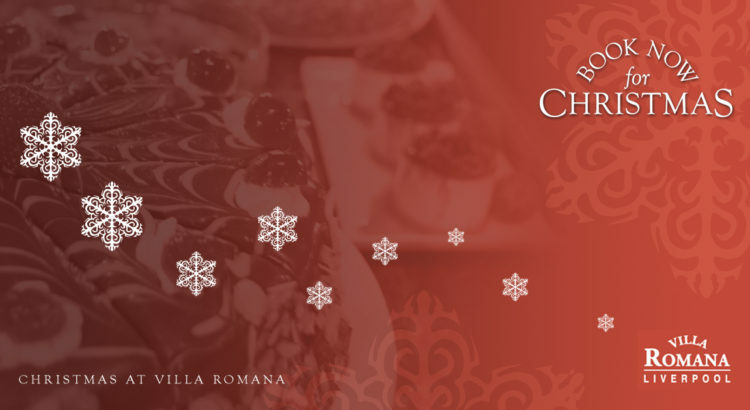 The Villa Romana Christmas lunch and Christmas dinner menus are online and available to book now. Believe it or not, bookings have already started coming in for Christmas 2017. our Christmas lunch and dinner menus are available in the menu section of our website. As you might imagine, our Italian food menus they feature some lovely traditional soups and risottos, as well as a selection of quality meat and fish choices. We are now taking Christmas reservations for the period from 30th November – 24th December, so you can enjoy a festive feast in our Italian restaurant right up to Christmas Eve, for a small or large group. Christmas lunch from our Italian food menu is £15.95pp for two courses or £18.95 for three courses. Evening Christmas dinner is great value at just £25.95pp for three delicious courses or authentic Italian dining at its best. Our Italian restaurant has served Christmas dinner in Liverpool for years now. We create a cosy, festive space and provide the warm welcome and friendly service that you’d expect from an authentic Italian restaurant. Our Italian food menu, popular all year round, is tailored during the festive season to include a range of wholesome, warming dishes to suit every taste. Sautéed mushrooms with garlic, lemon and white wine. Risotto, with sautéed mushrooms, garlic, white wine, lemon juice and cream, topped with chopped roasted chestnuts. Classic prawn cocktail in a marie rose sauce. Medallions of Turkey breast, pan fried with parma ham and sage in a lemon butter white wine sauce. Parmigiana, roasted aubergines with mozzarella and parmesan cheese in a tomato sauce. Fillet of Salmon, pan fried with cherry tomatoes, with a cream and basil sauce. Every meal in our Italian restaurant also affords the opportunity to end with a selection from our famous dessert cart. If you wish to make a Christmas reservation with us, particularly if it is for a large party, please do not delay.